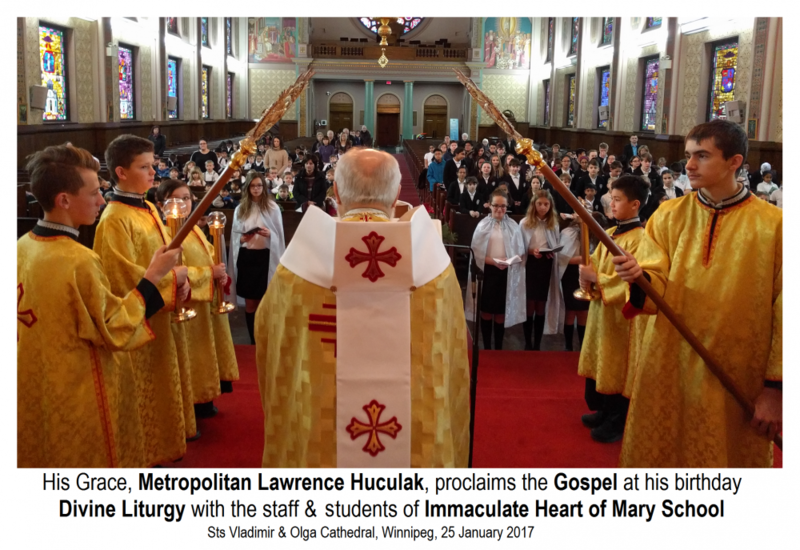 Immaculate Heart of Mary School invited the Archbishop of Winnipeg, Metropolitan Lawrence Huculak to celebrate the Divine Liturgy for the whole school on the occasion of his birthday – January 25. The service took place at Sts. Volodymyr and Olha Cathedral which is only a couple of blocks away from the school. By 9:00 am, the cathedral was filled with surprisingly well-behaved students, but an air of excitement pervaded the majestic church. The Metropolitan was joined by the school chaplain, Basilian Fr. Julian Khomechko as well as Fr. Yaroslav Buduykevuch, Syncellus Fr. Mark Gnutel and Chancellor Fr. Michael Kwiatkowski. Deacon Victor Humniski was also present. Principal Rod Picklyk introduced the event with some explanations as to some special moments that would take place that morning. The children responded with enthusiasm and confidence throughout the liturgy. Being the feast of St. Gregory the Theologian, the Gospel reading was about the “Good Shepherd” (Jn 10:9-16) and His Grace, Metropolitan Lawrence, preached a homily on that theme. His opening comments of how the students would have conducted themselves in making their way to the Cathedral that morning without leaders elicited smiles and giggles from the unique congregation. He described images of children wandering off in all directions, perhaps putting themselves in danger in traffic and going to the wrong buildings – never mind the possibility of ‘wolves’ preying upon the innocent “fluffy sheep”. Of course this led into the theme of leadership and need to follow shepherds in life and to be shepherds – the quintessential shepherd, of course, being our Lord, Jesus Christ Who revealed Himself as the Good Shepherd (Jn 10:14). At the close of the Divine Liturgy, on behalf of the school community “and the parents and grandparents and the Sisters and all present”, Mr. Picklyk and a student presented the Metropolitan with a gift. His Grace, in turn, as a token of his gratitude that a choir from the school sang carols at an ecumenical event hosted by the Archeparchy the previous week – presented the school with an honorarium. At the close of the morning event, the school choir then sang a traditional New Year greeting of sowing good fortune and God’s blessing for an abundant harvest throughout the new year.